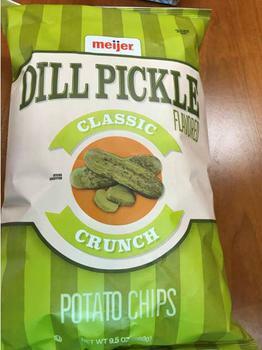 Shearer’s Foods of Massillon, Ohio, is recalling Meijer brand Dill Pickle Flavored Potato Chips. The family of a consumer has reported suffering an allergic reaction. The recalled product, which comes in a 9.5-oz., bag with the UPC # 719283594365 and sell by dates between 07/16/18 and 08/13/18. was shipped to Meijer stores in Ohio, Michigan, Indiana, Illinois, Kentucky and Wisconsin, from April 20, 2018, until May 29, 2018. Customers who purchased the recalled product from may dispose of it or return it to the place of purchase for a full refund. Consumers with questions may contact Shearer’s toll free at (800) 428-6843 Monday through Friday, between 9:00 a.m. and 4:00 p.m. (ET).